Before moving on to Dying Light, Techland got their feet wet in the open world first-person zombie smasher genre with Dead Island and Dead Island: Riptide. Both received mixed reviews, with Riptide faring more on the negative end of the spectrum. Dead Island Definitive Collection brings both of these games and all of their DLC to the PS4 with a fresh coat of polish, but is that polish enough to fix the issues that many had with it the first time around? I played the original Dead Island on PS3 pretty extensively. I wanted to like it. In many ways, I did. But there was the nagging feeling that the game was just a dull and unpolished mess of fetch quests that happened to have a bunch of zombies blocking me from my goal. It’s a sentiment that a lot of players had, and these issues are ones that were subsequently resolved by Techland when they moved away from Deep Silver as a publisher and released Dying Light. While I hate to compare the two games, it’s essential to understanding my feeling towards Dead Island Definitive Collection. 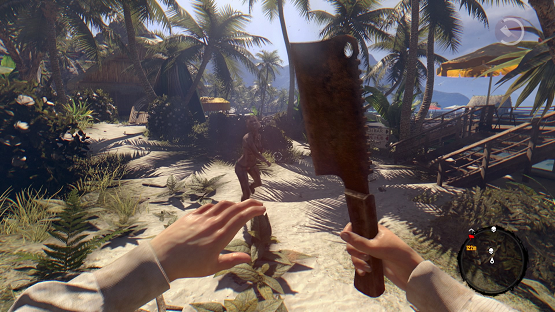 For those unfamiliar, Dead Island is a first-person zombie game set on the tropical island paradise of Banoi. It’s an interesting juxtaposition to see the walking dead flooding sunny beaches and shambling out from behind palm trees. In fact, this unique premise was part of the draw of the game originally; putting death into a place that seemed so safe, bright, and fun. There are four characters to choose from, with each one specializing in a specific weapon type, such as sharp, blunt, or firearms. Unfortunately melee combat is prioritized over gunplay, meaning that the firearms specialist feels useless until much later in the game when guns and ammo start to become a little bit easier to find. Otherwise the character selection follows a game like Borderlands, complete with unique skill trees for each. The overall idea for Dead Island is a novel one, something that seemed good on paper and has plenty of potential. 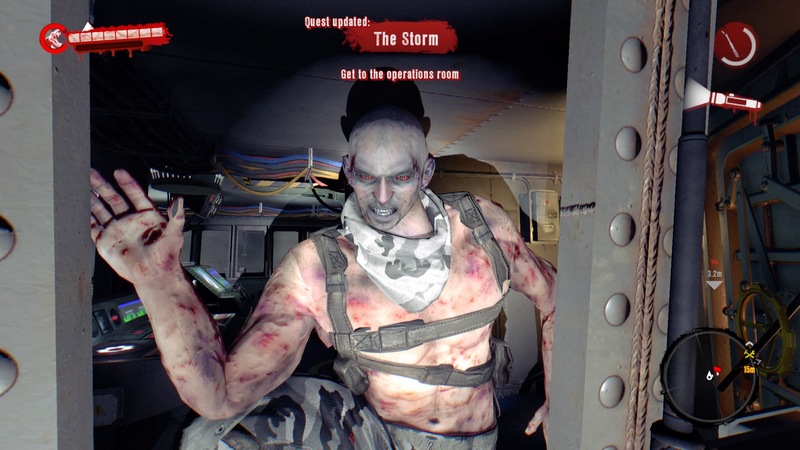 Technical issues and repetitious quests meant the game fell just short of what it could have been, and the sequel, Dead Island: Riptide, just added to the problems rather than fixing them. While some aspects where a lot of fun — namely bashing zombies’ brains in with an assortment of melee weapons scattered around the island — the nagging feeling of tedious mission structure returns over and over again. Apparently being immune to the zombie virus means that you get to be the one to do basically everything, which in one case is four back to back missions to go find food for a bunch of survivors. Or go find that necklace. Or that teddy bear. Or that husband. Or virtually anything that anyone could have possibly left behind when they were scrambling to not get turned into a living corpse. It’s these very things that remastering the game on PS4 can’t fix. Don’t get me wrong, both definitive versions of Dead Island and Riptide look great. It’s thanks to a complete rebuild of models in the game, the lighting, the shaders, and a bunch of other really technical stuff like ambient occlusion, motion blur, and anti-aliasing that helps the game to look like it really belongs on the current generation of consoles. The dynamic lighting in particular makes a huge difference in making the visuals really pop, especially in situations where you move from dark to light areas and where shadows are present. Despite the impressive visual upgrades, I couldn’t help but fall into the same feeling of tedium that the original release filled me with. The first couple hours of slaughtering zombies are pretty fun, but each time I get asked to go get some gas for someone, or to raid the nearest gas station for juice boxes, I just want to hurl my controller at the TV. Perhaps it’s because I sank so much time into multiple characters in the original release that Dead Island feels definitively dated. I know it probably wouldn’t have been the easiest thing to do, but allowing import of characters from the PS3 game would have gone a long way in feeling like I wasn’t just hitting the reset button on a game I already had a tough time convincing myself to continue playing. 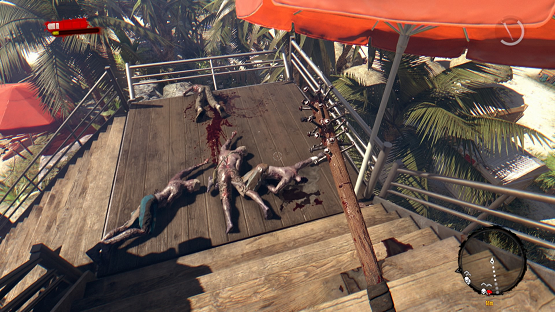 Dead Island is a game that shines brightest when played with other people. Perhaps there’s something about having someone else to suffer the tedium with you? Or maybe it’s just the distraction. Either way, I always enjoyed my time in this bloody paradise a lot more when I had a couple of friends with me, though lacking split screen made it decidedly more difficult to arrange times to play with friends online, as opposed to being able to sit down with my wife and play on the couch. Not adding split screen to this collection feels like a hugely missed opportunity, especially considering old characters already don’t carry over. And here’s where that comparison to Dying Light comes in. Dying Light is Dead Island in every way but better, so a prettier looking release of a game that is a notable step down from another zombie game that we also recently got an enhanced edition of feels unnecessary, especially if you’ve already played Dead Island. I’m just worn out after that. 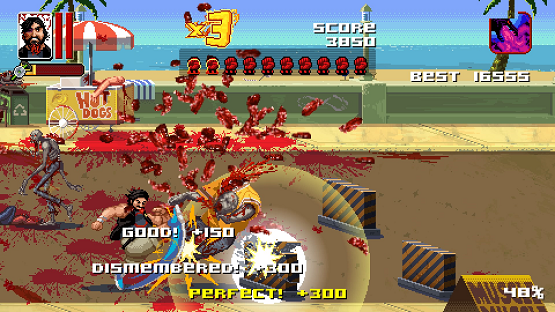 The real highlight of Dead Island Definitive Collection is Dead Island: Retro Revenge. A man on a mission to rescue his cat must run and punch his way through hordes of zombies, soldiers, and thugs using insane special weapon pickups and magic abilities (like a dragon that burns everything on screen). A retro visual, side scrolling runner styled game, Retro Revenge strikes me as a kind of Amplitude with zombies as you switch lanes and must hit enemies perfectly for massive combos and huge points. I can see myself pouring a lot of time into Dead Island: Retro Revenge to try to maximize combos and stay at the top of the leaderboards. All in all, $39.99 isn’t a bad asking price for the whole package. Riptide Definitive does let you import your Dead Island Definitive characters, so the collection feels like one huge first person zombie game as you can continue your character’s progress immediately after completing Dead Island. Tossing in Retro Revenge on top of the mix for the retail release of the game isn’t just the cherry on top, but makes up a couple of the heaping scoops of ice cream underneath. And the whipped cream. If you’ve never vacationed on Banoi, now might be the prime time to do so, because the island looks better than it ever has before. Just be warned, the helpless locals pretty much want you to do everything for them. For those of us that have played Dead Island before, there’s not much in the Definitive Collection to drag us back. Lack of adding previously missing features like split screen and the inability to import last gen character saves make playing Dead Island again feel more like a chore than an enjoyable experience. With so much else out right now, I am hard pressed to actually want to spend my time on Banoi again, prettier lighting effects or not. Dead Island: Definitive Collection review code provided by publisher. For more information on scoring, please read our Review Policy here.